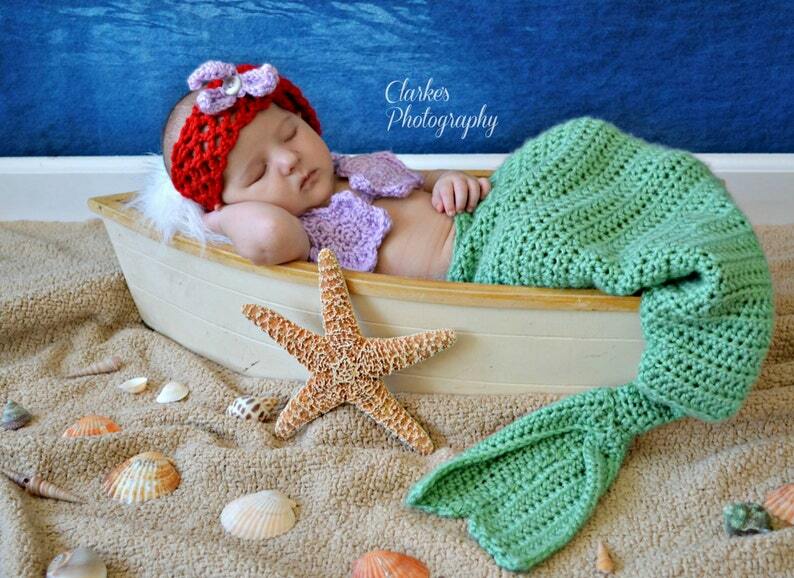 This listing is for a crochet baby Mermaid 3 piece costume set. The size is for a 0 to 3 month sized infant. The heaband is made with Caron Simply Soft yarn (100% Acrylic) in Autumn Red. The sea star on the headband, the starfish top, and the mermaid tail are all made with Caron Simply Soft yarn (100% Acrylic) in Aqua Mist or Sage (depending on which one is available) and Lilac. The half double crochet pattern was done using an H sized hook. The starfish top is adjustable to provide full coverage. The mermaid tail has a pull drawstring, which ties in the back to ensure a snug fit.